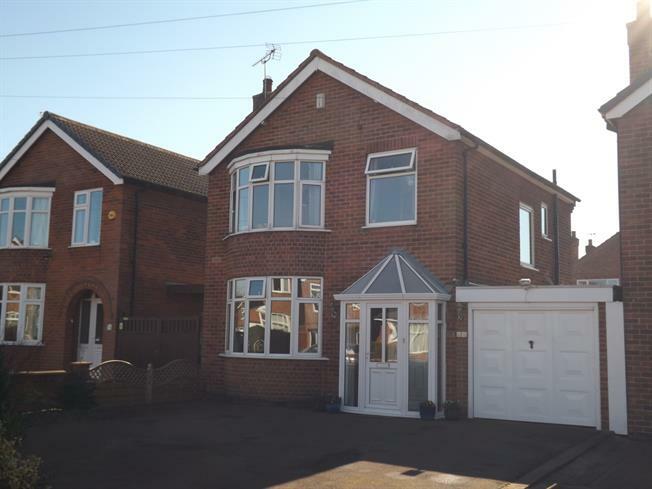 3 Bedroom Detached House For Sale in Nottingham for Asking Price £310,000. Guide price 310,000-320,000. A very well presented three bedroom detached house with a south facing garden. In brief the accommodation comprises entrance hall, lounge, dining room, kitchen, utility, full width conservatory. To the second floor there are three bedrooms and a stunning 4 piece family bathroom. Off road parking. Garage. Window to the front elevation, radiator, multi fuel burner. Radiator, laminate flooring, folding doors to the conservatory. Laminate flooring, pantry, roll edge work surface, wall and base level units extending into the conservatory, range oven, overhead extractor. Radiator, laminate flooring, upvc glazed. Sink unit, work top, wall level units, wall mounted boiler (installed 2017) with Nest function. Window to the rear, radiator, laminate flooring. Roll edge work surface, base level units, plumbing for washing machine, door to the rear garden, door to the garage. Window to the side elevation. Loft access via pull down ladder, the loft is part boarded with light. Windows to the side and rear elevations, radiator, tiled walls. Low level WC, freestanding bath, single enclosure shower, pedestal sink. To the front there is off road parking and a garage. The rear garden is mainly laid to lawn with 2 decked areas, tap and light.